Dota 2 is one of the most popular video games on the planet and one of the biggest competitive esports titles the world over, but it has a particularly passionate fan-base over in the Philippines. If you are a Filipino Dota 2 esports fan looking for safe real money betting sites to place a wager on your favorite players or teams, look no further than this guide. 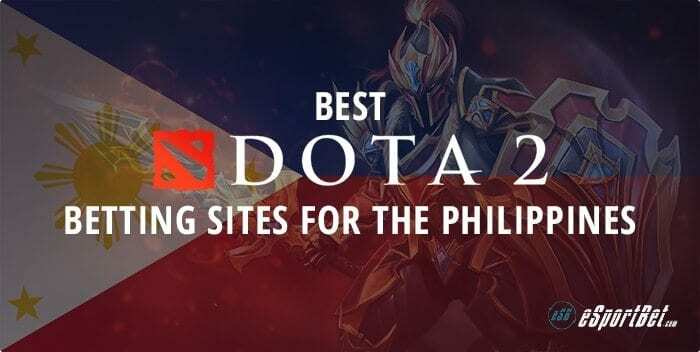 Fans of Dota 2 esports residing in the Philippines can bet on their favourite players and teams at a number of Dota esports betting sites, all licensed and regulated in world-class international gaming jurisdictions. You can sign up for an account or read our full reviews for more information one each sportsbook, including bonuses, competitions, promos, and Dota 2 betting options by following the links on this page. Foreign sportsbooks are 100% allowed to cater to Filipino players; your only local option in the Philippines is MegaSportWorld, which holds the land-based sports betting monopoly across the country as it is state-run, but they don’t offer esports betting markets. While we expect most visitors from the Philippines to be familiar with or experts in all things Dota 2, we do acknowledge there are many curious and casual esports fans who are still a bit shaky on the details. For everyone unfamiliar with its significance, Dota 2 is a free-to-play multiplayer online battle arena (MOBA) video game developed by Valve Corporation, the studio behind two other massive esports titles – Counter-Strike: Global Offensive and Overwatch. Dota 2 pits two teams (Dire and Radiant) of five players against each other in a highly competitive race to destroy the other team’s base, referred to as the Ancient. Each player selects a hero at the start of the game, with every hero possessing their own unique abilities, playstyles and attributes (Agility, Intelligence or Strength) that serve up different pros and cons for tight gameplay balance. Each side dukes it out on the battlefield with the opposing team’s heroes, collects experience points and items and ultimately overrun the other side and destroy their Ancient first. With the amount of heroes available (over 100) and tons of different styles of play and tactics, Dota 2 makes for a great, edge-of-your-seat competitive esports game to watch and bet on. Dota 2 actually started life in 2013 as a standalone sequel to a WarCraft 3 mod called Defense of the Ancients, which took the gaming community by surprise with its rapid growth in popularity despite being an unofficial modification. Released on Steam and playable on Microsoft Windows, Mac OS X and Linux platforms, it has over 10 million concurrent players every month, reaching over 100 million concurrent players at its peak – many of those players located in the Philippines. What esports deposit options can I use in the Philippines? Virtual e-wallets such as Neteller and Skrill are highly recommended for Filipino esports bettors, due to their widespread availability at many sites and their reputation as trustworthy payment services. They also keep your personal bank/card accounts separate from the sportsbook in question, so if you seek additional privacy, they are the best possible deposit and withdrawal option for betting on Dota 2. You can use both options at Betsson. Using Bitcoin for esports deposits is also highly recommended for Filipino bettors, for the same reasons as virtual wallets – convenience and security. Nitrogen supports Bitcoin bets for Filipinos looking to win big cryptocurrency on Dota 2. Can I bet on Dota 2 esports using pesos? Unfortunately, the Philippine peso (PHP) is not a commonly supported currency at our recommended esports online betting sites. Some sites used to have it as an option, but at the time of writing none currently support pesos. We recommend Filipino esports bettors take note of currency conversions and associated fees prior to signing up to bet on Dota 2 esports. The sites listed above support the world’s most common currencies, including CAS, EUR, GBP and USD. It is really easy to bet on Dota 2, so for any of our Filipino or international readers worrying whether placing a wager is as complicated as the actual game (complexity isn’t a bad thing – that’s why Dota 2 is so competitive and popular!) put your fears aside because the world’s best sportsbooks make it very easy for us – and our types of bets in esports guide, if you need to brush up on the basics. Match winner: This market is the simplest available – you are betting on which solo player/team wins the match. Dota 2 is a best out of 3 game, so your wager is based on which player or team you think has the best chance to beat the other out of 3 rounds. First Blood: This market lets you wager on which player or team will kill their opponent first and is a common bet type in many other esports titles. In Dota 2, First Blood can be an exciting wager given the first ten minutes of each match and the preparation and tactical placement of players across the map is crucial to determining who will have the initial advantage – but sometimes all it takes is one stupid mistake for a player to get whacked, so it is definitely a volatile market with sometimes worthwhile rewards. Map winner: This market allows you to bet on the team who wins the specified Dota 2 map. It is a common bet type across other esports, but in Dota 2 you are actually betting on whether the team wins an individual map (one round), so it’s a good wager if you think a particular team may edge the other out on a particular map, or you don’t have time to watch the entire match. Over/Under: This market allows you to bet on whether the round will take place over or under the amount of minutes the sportsbook specifies. Dota 2 matches usually go on longer if the teams are more evenly matched, and fizzle out early if there’s a clear dominate line-up. It’s a decent wager if you have intimate knowledge of each team and their players, but given the unpredictability of this glorious game, it can easily back-fire on you – so it’s not one type of bet to take lightly. How popular is Dota 2 in the Philippines? For some perspective on its mass popularity, Dota 2 was the #1 esports game streamed on Twitch in April 2017, beating League of Legends with 32.2 million esports hours watched due to the Dota 2 Asia Championships. The Manila Major, which was the third event of Valve’s Dota Major Championships in 2016 and handed out over $3 million in prize-money, recorded over 9 million hours watched on Twitch by Filipino fans tuning into the official live-steams. The Philippines currently has over 1.8 million esports enthusiasts in 2017 according to NewZoo Insights and the majority of those have watched a Dota 2 esports event live stream or attended the local Majors. Dota 2 has contributed a massive amount to the growth of the esports industry, primarily because Valve Corporation designed and positioned it as an esports title from launch. For starters, the company put up a total prize pool pot of $1.6 million and funded the first ever Dota 2 esports competitive annual tournament, The International in 2011 – which has since become the largest esports tournament in the world. Value funds and sponsor smaller seasonally held tournaments around the world, previous advertised under the Dota Major Championships banner. The Dota Majors have since been replaced with the Dota 2 Pro Circuit, dividing tournaments into two divisions – Major ($500,000 or more) and Minor ($150,000 or less) with individual players on winning teams awarded “Qualifying Points” if they finish in the top four. From there, they are placed on a leaderboard and invited to The International if they are in the top 8 best ranking teams in the world.